FITARA ABCs: Does the CIO Make a Difference? Acting agency CIOs are keeping pace with their permanent counterparts, the latest Federal Information Technology Acquisition Reform Act scorecard indicates. Nearly one-third of the agencies assessed under the FITARA scorecard are led by acting chief information officers, but these leaders are keeping pace with their permanent counterparts. 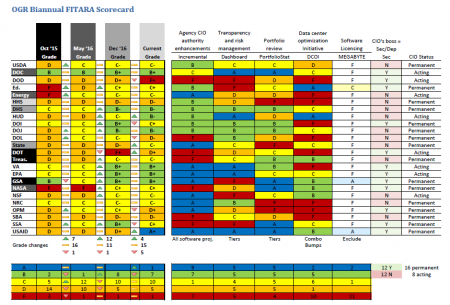 Of the 24 agencies that appear on the FITARA scorecard, seven are run by acting CIOs: the Environmental Protection Agency, Veterans Affairs, the National Science Foundation, and the departments of Transportation, Commerce, Energy, and Defense. Congress releases the FITARA scorecard, which evaluates agencies on Incremental Development, Risk Assessment Transparency, IT Portfolio Review Savings, and Data Center Consolidation, twice a year. The most recent scorecard was issued June 13. Overall, FITARA grades this time around dipped. However, the agencies run by acting CIOs did not seem to be worse off than those run by their permanent counterparts. Three acting CIO agencies—EPA, VA, and Commerce—received B’s. Energy and NSF received C’s. DOT earned a D, and DoD received an F.
Roger Baker of Roger Baker Consulting, the former assistant secretary for Information and Technology and CIO for the Department of Veterans Affairs, said acting CIOs do not make or break their agencies’ scores because they carry on the work of the permanent CIOs before them. “They will keep marching down that path until there’s a new CIO,” Baker said. DOT improved in its overall grades since the previous scorecard, which was issued in December. EPA, VA, DOC, Energy, and NSF’s grades all stagnated, and DoD’s grade declined. This trend is par for the course on this scorecard. Of the 24 agencies’ overall grades, four improved, 15 remained the same, and five declined. Richard Spires, chief executive officer at Learning Tree International and former department of Homeland Security CIO, said the drop in overall grades was an expected consequence of a shifting administration. Spires noted that some acting CIOs are standing in for political positions that have not been filled yet. Of the four agencies where CIOs are politically appointed, three are currently led by acting CIOs: EPA, DOT, and VA. Spires said the administration has been slow to name people to these posts. CIOs can be political appointees or career, noncareer, or general executives. The FITARA scorecard was designed by the U.S. Government Accountability Office and is distributed by Congress. Baker said a larger shift needs to occur within OMB’s enforcement of FITARA. He said OMB should grant or withhold funding based on how agencies perform. For example, agencies that receive A’s should get a small percent increase in funding and agencies that receive F’s should receive budget cuts and invitations for their secretaries to testify before Congress. Rep. Will Hurd, R-Texas, said he has spoken with appropriators about how to get agencies to pay attention to their FITARA grades. Dave Powner, director of IT Management Issues for GAO, said four agencies called his office on the morning the scorecard was released to discuss their grades. Hurd told MeriTalk on June 21 that FITARA needs more enforcement and that these questions about grades are a sign of attention. Baker admitted that sometimes agencies with good FITARA programs get lower grades than they deserve, while some agencies are overrated. The U.S. Agency for International Development became the first agency to ever receive an A as an overall scorecard. Unlike the department of Commerce, which has hovered at either a B or a B-plus since the scorecard’s inception two years ago, USAID had consistently received D’s on the previous four scorecards. Baker said Commerce’s consistently high scores are a bit of a mystery because the CIO of the department oversees many different components, for which standards can be hard to create. For example, Baker said Commerce’s CIO does not give the Census Bureau’s CIO IT instructions. Alan Balutis, director of Cisco’s Internet Business Solutions Group and founding member of the Federal CIO Council, pointed out that GAO’s report accompanying the FITARA scorecard reflects a different span of time than the scorecard itself. GAO’s report, which was also released June 13, discusses efforts and people from a period that extends long before December 2016. For example, the GAO report references projects conducted by LaVerne Council and Terry Halvorsen, both of whom have left their posts as CIO of VA and DoD, respectively. Balutis also said it is difficult to measure the impact of acting CIOs across the history of IT modernization because, at any point in time, there are usually CIOs in charge at some agency. “There’s probably always some who have acting, so it’s a tougher thing to draw on,” Balutis said. Spires said the next scorecard, which will probably come out in December or January, will be particularly telling about the Federal IT modernization landscape. He said that agencies’ performance in the next six months will indicate how well FITARA is working. For now, though, Spires said he is cautiously optimistic.